The right hand-side wi-fi cable was suddenly chopped off. Actually, looking at one end, it looked like it was sliced off. My question is...where does it go? 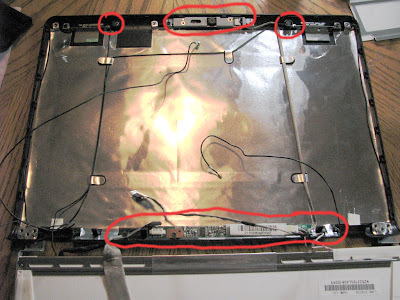 into the LCD panel like the left wi-fi cable? Is this fixable or am I going to be permanently relegated to an external wireless adapter? a shot of the inside of the top case where the HP dv2000 lcd lives. As you can see the LCD panel has been removed already and I have traced where the Wi-Fi cables for the DV2000 internal wi-fi card run up each side of the panel. They should be replaceable.. and or you could try and splice the cable back together and tape it with electrical tape just make sure you have enough length to route it back to the bottom of the case where the card lives. In this one I have circled the Microphones for the DV2000 at the top and the Web Cam location. Down at the bottom you can see where the HP DV2000 LCD inverter lives in the case. Thanks. I spliced the wifi cable and used some of that solder from the video card job and put the wires together with some e-tape. Your trick worked on the video card! I am writing from my reborn HP DV2000! Congrat's on your repair... good luck.